I like to think of a few outdoor rainy day activities, so when it rains, it actually gives us more of a reason to get outside. 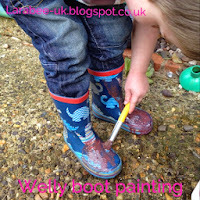 With a weekend of rain looming I started to think of things we could do so when T came home from nursery saying that they'd painted old wellies to use as flower planters, I thought we could paint our wellies and then jump in puddles to wash them clean. 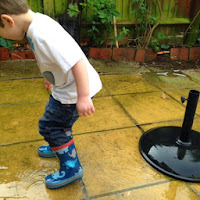 This idea was slightly scuppered by the fact that it didn't rain, so we got the hose out instead as I'd already promised T that we were going to do this. 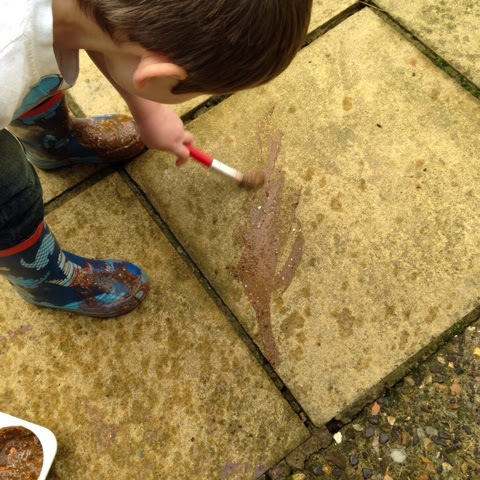 I mixed a little paint with glitter and some mud from the garden. We painted our wellies all over and then moved onto the patio. 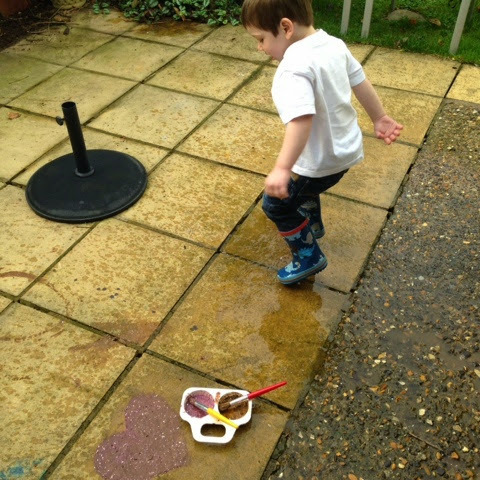 After a while, I turned on the hose and started to make some puddles, T got jumping! Then of course, I lost the hose to the hose king and he used it to clean off the patio and sprayed our wellies, to get off the remaining paint. 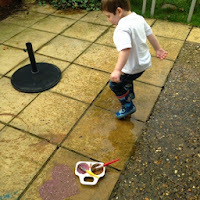 Even when everything was clean the puddle stomping continued. T loved this activity and anything which is 'clean messy play' is OK with me! We both had lots of fun jumping in the puddles too. 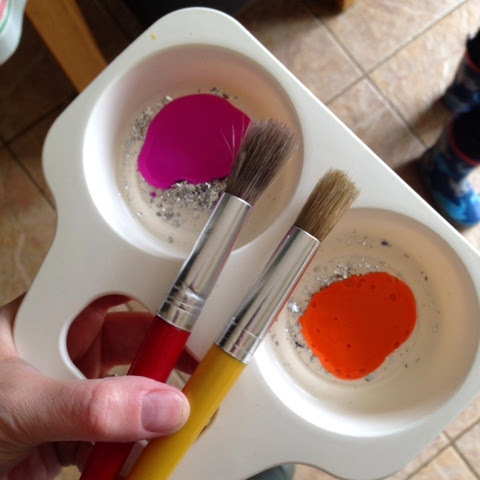 What a great idea for an activity, it can be difficult to encourage outdoor play when it's wet and raining. 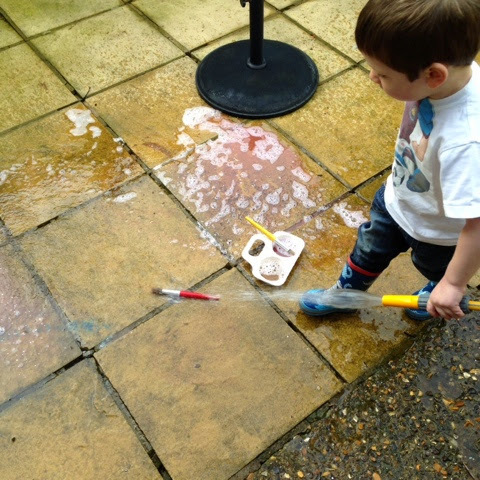 I love that T took over the hose and started cleaning the patio, I hope he enjoys cleaning when he gets older as well. Thanks for linking up with me on Country Kids. What a fab idea! I'm definitely doing this with my two as our next rainy day activity! A great idea! I love that you get messy, but still can clean it all up easily! Puddle jumping us a favourite of ours too, which kid doesn't like splashing in puddles for fun. A especially loves to puddle jump and then of course sit in the puddle as well, several changes of clothes are required when it's wet!